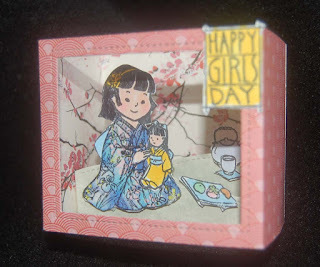 Even though I don't have any daughters or granddaughters, I still like the Japanese tradition of celebrating Girl's Day on March 3rd (third day of the third month). 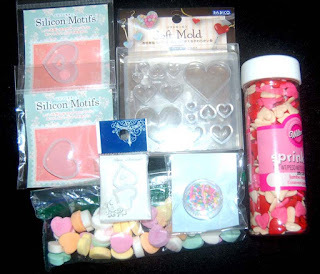 Eating pretty, sweet mochi is my favorite part of the day. 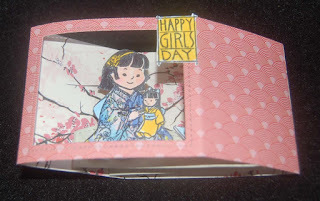 I also love making shadow box cards. They remind me of dioramas I used to make for the library book competition....miniature scenes were my thing. 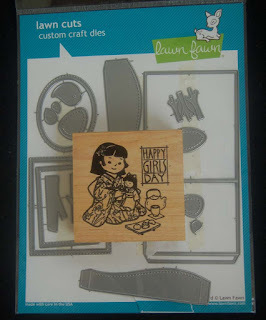 Lawn Fawn's shadow box die set makes it super easy to produce the frame work. 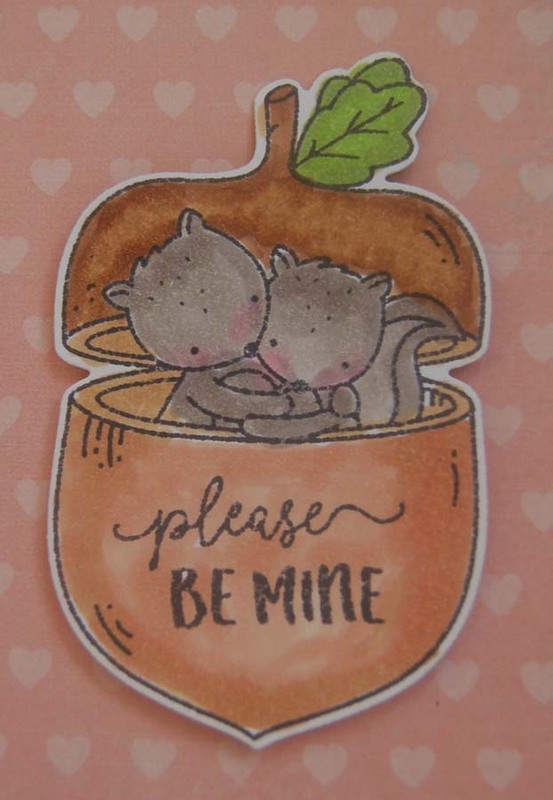 I used a Kaiser Craft printed double sided card stock because it had a sweet cherry blossom design. 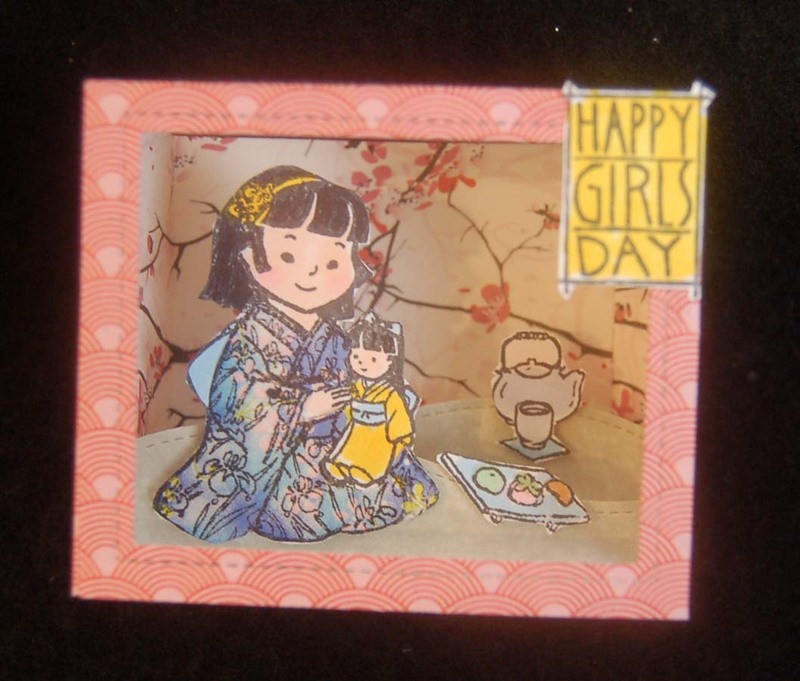 All the images and the sentiment came from a Mari and Me wooden handled stamp that's been in my collection for years. I stamped the kimono part on a piece of printed origami, fussy cut it out and glued it on to the girl before fussy cutting her out. Copic pens were used for coloring the rest of the pieces before they were attached to the die cut green paper pieces. 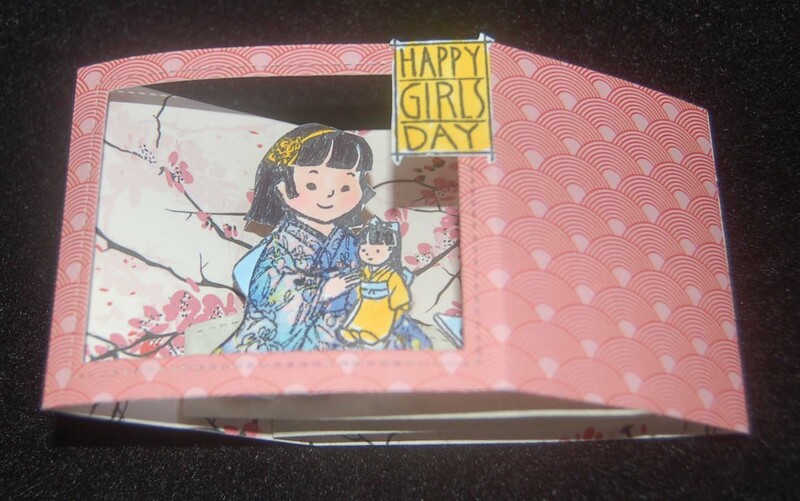 The neatest part of this card is that it folds flat for mailing. I think you'll have fun making shadow boxes too. 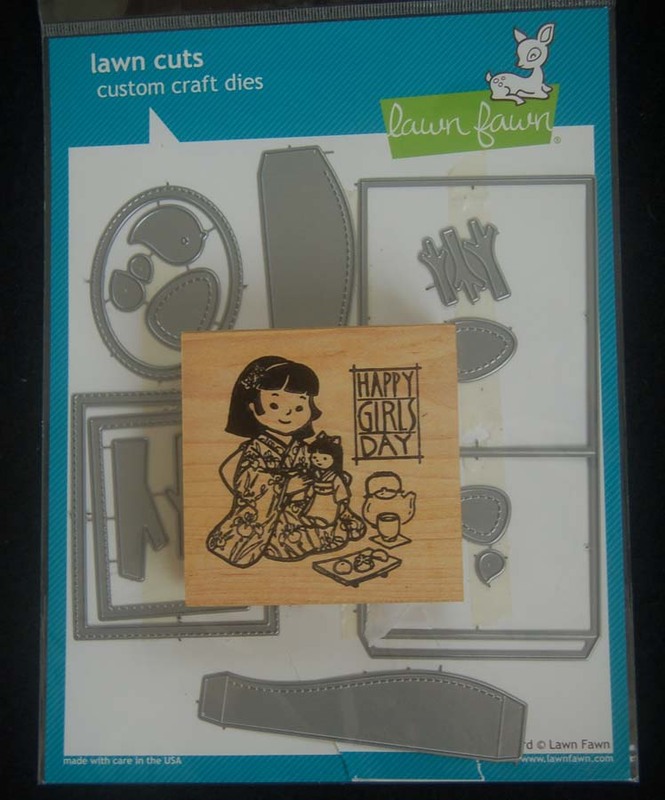 Look for the Lawn Fawn die set in HM Ben Franklin Crafts. 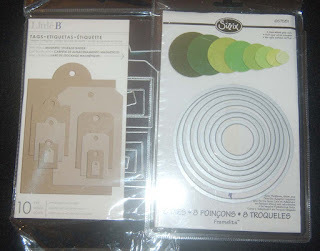 Oh yeah, don't forget that you can attach a mini calendar to the back of the card.....if you have any calendars leftover...LOL! Local folks know that when you return from a trip it is customary to bring home gifts for family, friends, and those who helped to make your trip enjoyable. This gift is called an 'omiyage'. 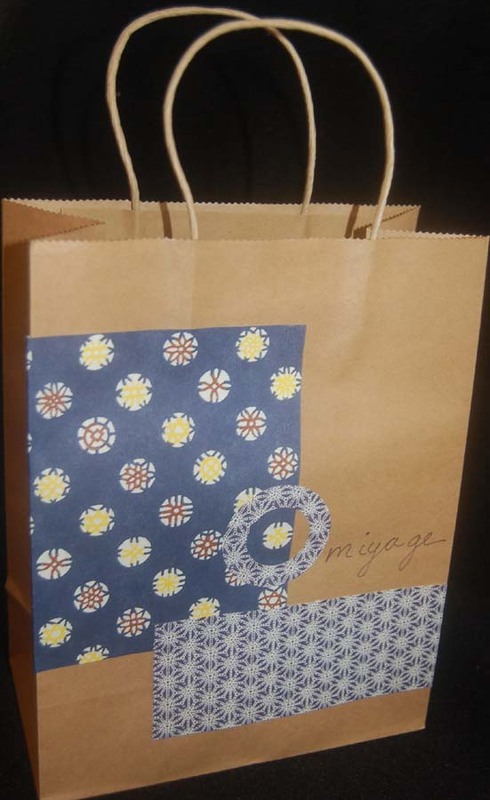 I really should make decorated 'omiyage' bags before I go on a trip....but you know how time doesn't allow this. Therefore, after returning from the Tucson Rock and Gem Show I had to make a quick bag and tag. 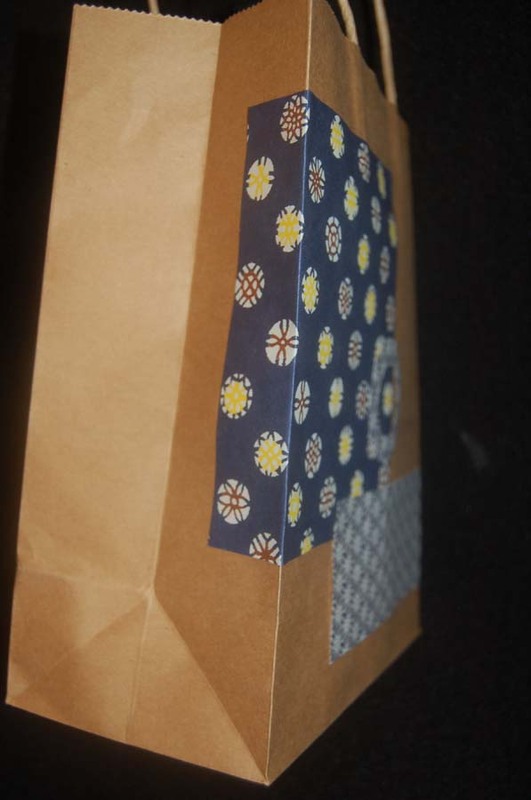 These were inspired by the Japanese minimalist style and used just a few sheets of origami paper. I used a Sizzix circle die set to cut the 'o' and wrote in the rest of the of the word freehand. Using a die from my frequently used Little B tag set, I did a similar design on the tag which I will use on plain handled bag. The 'o' could be cut with oval dies but I felt the circle 'o' had a more Asian look. 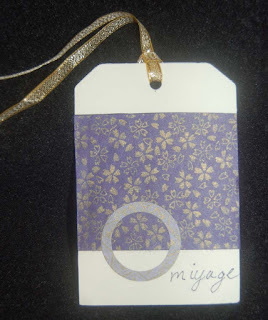 I hope this post has inspired you to make simple, quick 'omiyage gift bags and tags. 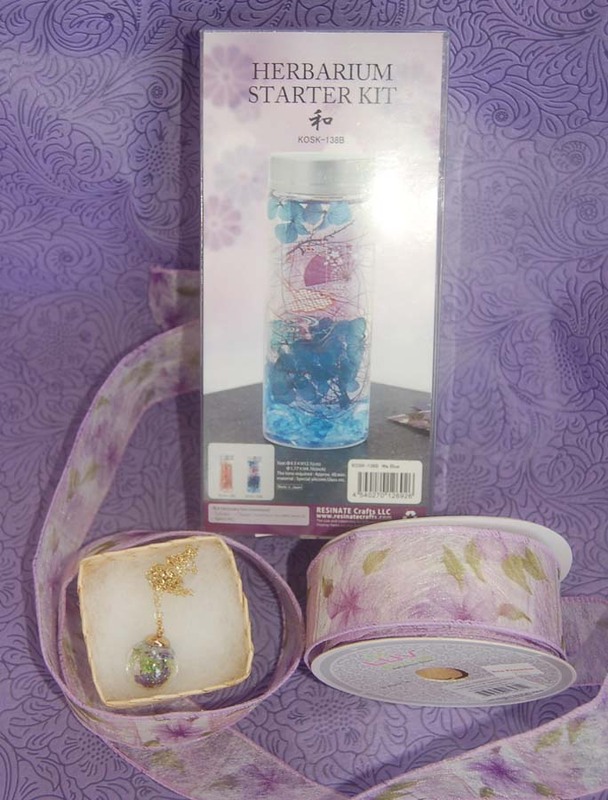 They really only take a few minutes and will make the recipient feel very special and know that you are grateful for them. 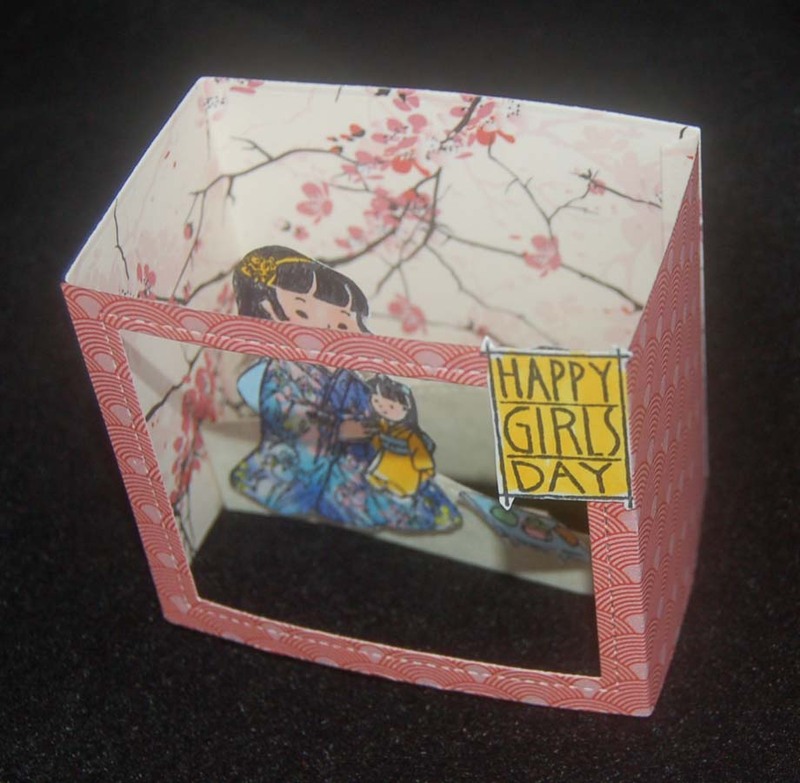 Okay, go use up those origami paper scraps! 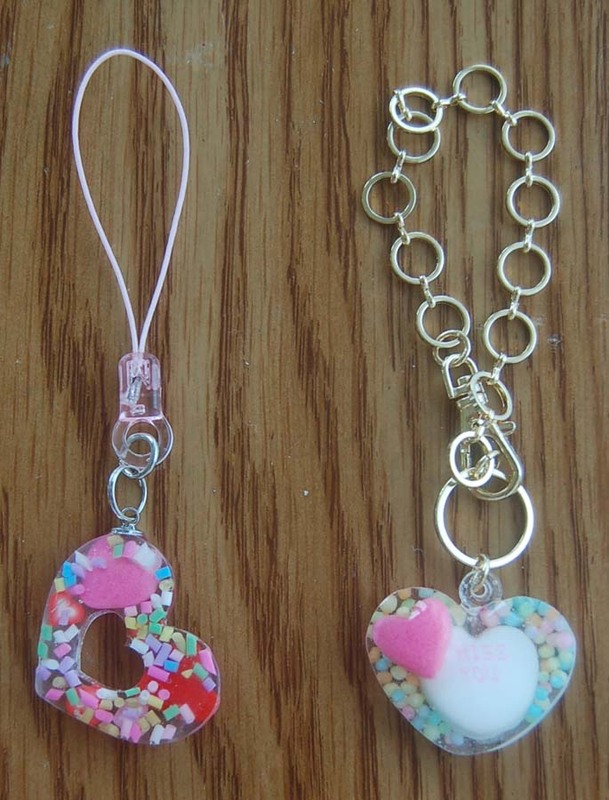 Here are two more gifts that are going to another birthday girl. 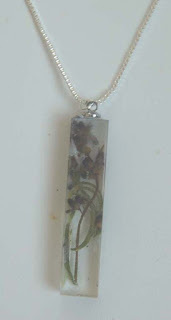 The first one is a resin pendant made in a flat rectangular silicon mold. I filled it with real sprigs of lavender from a Hokaido lavender farm. I added some pieces of rosemary (from my windowsill herb pot) because the lavender leaves all fell off in transit. I think the combination of plants looks rather realistic. 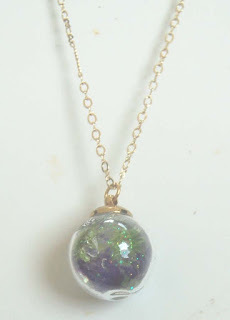 Not in the supplies photo, but truly necessary, I added a few drops of gel cleanser to release the pendant from the mold. In the bottom photo you can see that the BD gal will also be receiving a watercolor kit that I purchased at HM Ben Franklin Crafts. 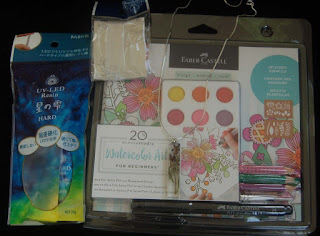 This Faber Castell product has all she'll need to make some super watercolored greeting cards. 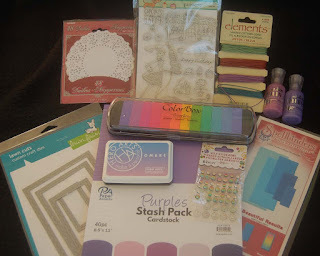 Included in the kit are watercolors, a paint brush, stencils, a pen, blank cards and color pencils. I think this is a great way to get someone started in designing greeting cards. It would be good for passing time during a long trip....I think I'll get myself a kit for my next plane ride! 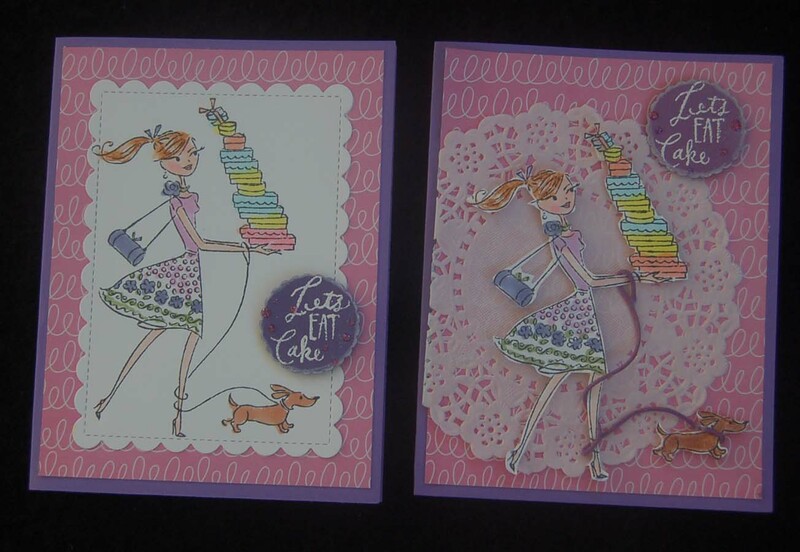 Here are two versions of birthday cards using the same Penny Black image (from Patisserie stamp set). Even though the images were stamped on the same marker paper, it's amazing how much brighter the card on the left looks. 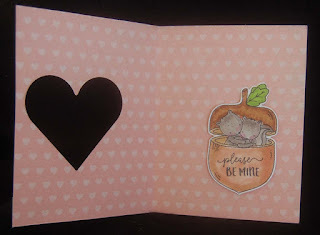 I think I like the card on the left better because it didn't require fussy cutting. I do like the daintiness of the doily and the 3D effect of the purple waxed cord leash (Elements from HM BFC) on the righthand card. 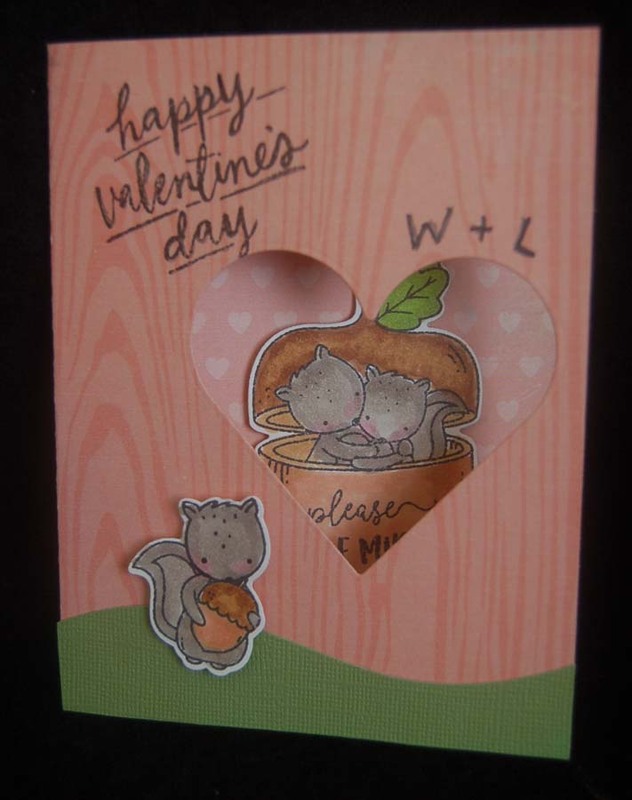 A Lawn Fawn scalloped die was used to cut the white rectangle on the outside and inside of the left card. Copic pens were used to apply color to the images. Click on images to see details up close. These are the insides of the cards. 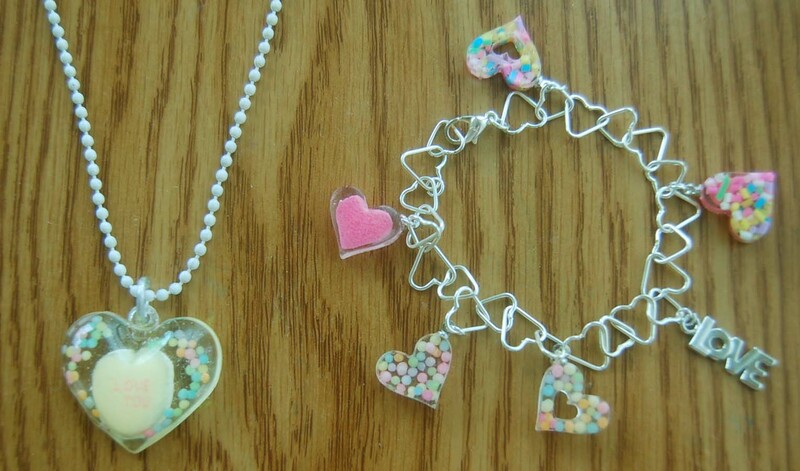 I made them differently too. 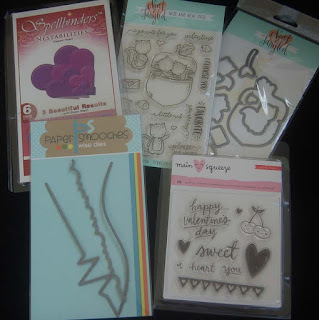 They were stamped with two of my 'ancient' wooden handled rubber stamps. 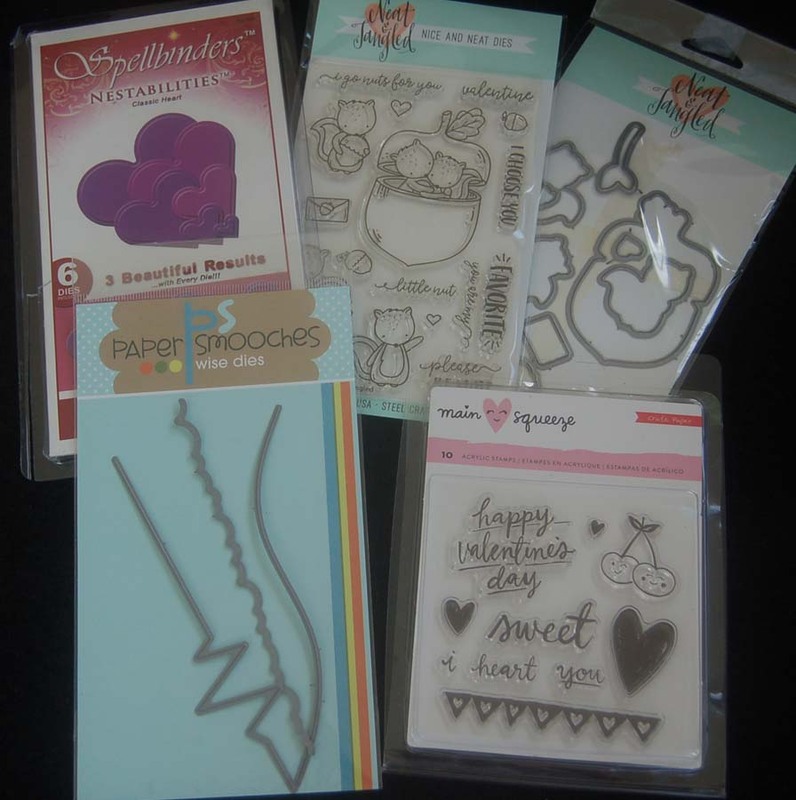 The rectangle shape on the right was die cut with a Spellbinders die and stamped with a Hero Arts ombre ink pad. 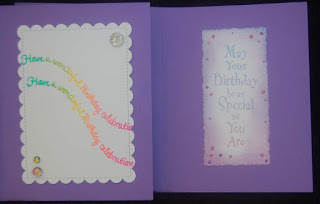 The rainbow colored sentiment on the left was made using a Colorbox pad sold at HM Ben Franklin Crafts. Embellishment dots on the left card are Darice acrylic stickers (from HM BFC). The sparkly dots on the righthand card were made with Nuvo Glitter Drops. 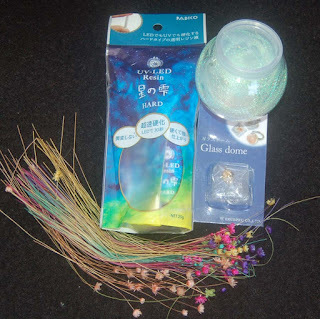 (This colored liquid is similar to Stickles but the tip is smaller so very tiny dots can be made....love them...gotta get more colors!) 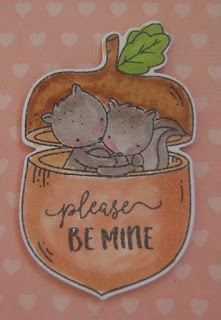 Although it is easier to make identical cards when you need multiples, it is so much more fun to play around with different versions...a good time to come up with new techniques. Celebrate card crafting!